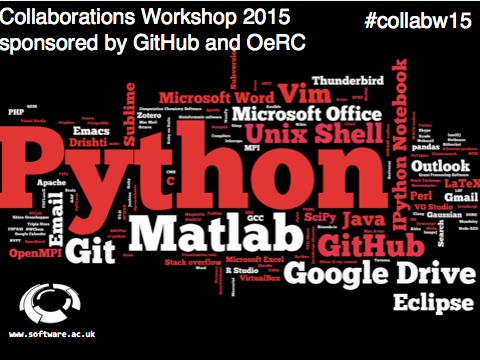 Collaborations Workshop 2015 - an electric mix of people! The Collaborations Workshop 2015 (CW15) took place last week in Oxford. It brought together an electric and buzzing mix of people with an interest in research software, and was the biggest Collaborations Workshop to date. An inspiring keynote, a raft of lightning talks, wide ranging discussions, demos and intense hacking, allowed people to explore new ideas and gain advice from experts. With funders, researchers, developers, publishers and managers in attendance, the workshop represented views from every position in academia. There are many outputs from the CW, which we have made available so that even people who could not attend the event can benefit from the discussions that took place. On the CW website, you can find summaries of the discussions, collaborative ideas, Hackday pitches, slides from the keynote and lightning talks, and the software written during the Hackday. Many of these resources are already available, and more will be available in the coming weeks. A number of themes and ideas emerged from the workshop. We were told to embrace imposter syndrome: it's natural to have some reservations about whether you're the best person for the job, you've got to embrace that feeling and get on with it anyway! Research outputs are changing. Although the world has not caught up with these changes, we should still think beyond the paper as the only research output to the linked collection of resources associated with the research. The workshop was a window into best practice and the technical choices made by the research software community. From a tools and languages perspective, the data we collected show that Python meets the needs of many (the Word-Cloud above was created based on responses to the question “what software do you use?”). Many are experimenting and even developing products using container-based approaches, such as Docker. Most people are exploring better ways to share code and data. Many attendees argued for easier re-use: it should be straightforward to take something, build it and adapt it. Despite this desire for easier re-use, everyone agreed that reproducibility is an incredibly complicated concept and difficult to attain. There was certainly a strong feeling of community and the benefits of seeing different people from different domains with different data facing and overcoming similar problems. Finally, there were a couple of calls to action. The academic world is changing, so it's time that people who inhabit non-traditional roles stop trying to adapt to outdated job specifications and start creating new ones. There was also a call to be proud about what you do and the contribution that you make to what is, after all, a fundamental part of our civilisation: the advancement of knowledge. And whilst pursuing these lofty ideals... it's also important to document what you do! The CW15 Hackday was fuelled by adrenaline... and pizza and caffeine. In only 18 hours, our hackers designed, collaborated, coded, tested and demoed a range of new software. From a tool that draws together the environment and data under which a graph was produced, to a game that shows the effect of distractions on the concentrations, the hackday presented a wide range of ideas in the space of interdisciplinarity. The hackday had people reflecting on the interplay between tools and data analysis. Whereas some felt that tools had a much broader reach as an outcome of a hack day, others stated data and its analysis was more like real research (and their day job). People were also concerned about How clean is your Hack: in six months will the project have stagnated? Based on this concern, we have pledged to track the Hackday work and its development over the coming year. Thanks again to our sponsors and supporters: GitHub and the Oxford e-Research Centre (OeRC). Thanks also to the venue team at OeRC, Institute staff, our keynote speaker, the panel and the most important group - the attendees for making this the best CW to date! We look forward to CW16! For more information about CW15 and what happened please look at the annotated agenda - more information will be added over the coming weeks to make this a useful resource to catch up on what's happening in the research software community.